With piano study so wide-spread and the number of quality pianists so numerous, a much higher standard of execution is expected. To perform an especially difficult piece would normally take eight to ten years of practice. Few people are in a position to devote so many years to this study, and consequently, their playing is uneven and incorrect. It is a known fact that one hand is always stronger and has more dexterity than the other, which has an impact on the ability to execute certain difficult passages in keyboard literature. The sheer importance of Hanon’s work for committed piano students is sufficient reason to get started with these exercises as soon as any young student has shown serious interest. 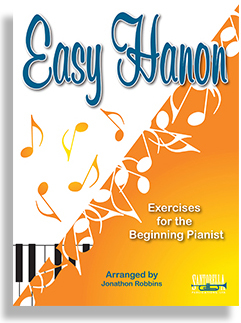 We are proud that Santorella’s Easy Hanon - Exercises for the Beginning Pianist, transcribed and edited by Jonathon Robbins, is the preference of most piano teachers in the United States and used by countless beginners throughout the world. Pick up a copy today and get your young virtuoso on the right track to becoming an exceptional pianist.